Over the past 20 years scholars, policymakers, and the media have increasingly recognized the links between both traditional and non-traditional security issues and the changing condition of the global environment. Concepts such as 'environmental security' and 'resource conflict' have been used to hint at these significant linkages. While there has been a good deal of scholarly work conducted that seeks to identify the ways that actors link these concepts, there has been little examination of the intersection between approaches to environmental security and gender. This book explores this intersection to provide an insight into the gendered nature of both global environmental politics and security studies. 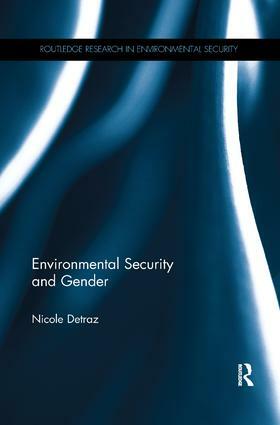 It examines how the issues of security and the environment are linked to theory and practice, and the extent to which gender informs these discussions. By adopting a feminist environmental security discourse, this book provides crucial redefinitions of key concepts and offers new insights into the ways we understand security-environment connections. Case studies evaluate if, and how, environment and security discourses are being used to understand a range of environmental issues, and how a feminist environmental security discourse contributes to our understanding of security-environment connections. This multidisciplinary volume draws on literature from the environmental sciences, security studies and sociology to highlight the complex human insecurities that often accompany environmental change. As conceptualizations of security continue to shift and broaden to include environmental issues and concerns, it is imperative that gender informs the debate. Introduction: where does gender fi t in discussions of security and the environment?